One of the first two Google smartwatches, the LG Watch Style is now on sale in the United States. Built by LG, the Watch Style and Watch Sport are the first smartwatches to ship with Android Wear 2.0 on board. 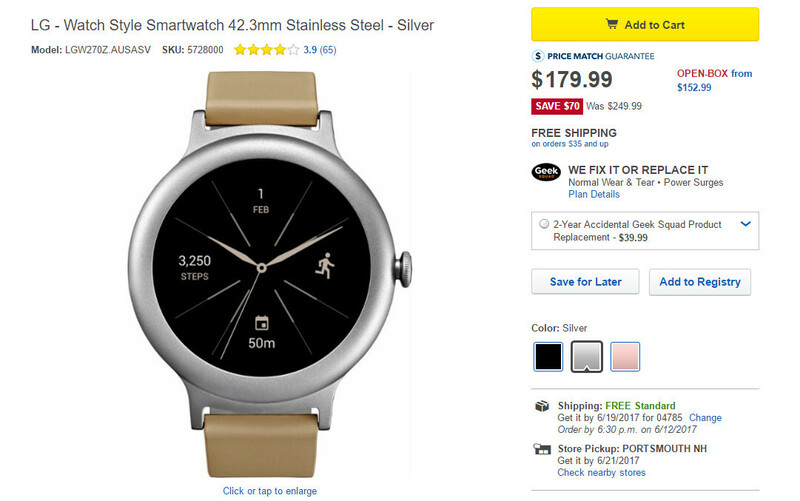 The cheapest of the two, LG Watch Style is usually available for purchase for $249, but Amazon and Best Buy have a better deal on the smartwatch. For a limited time, customers will be able to save $70 (28%) when they purchase the LG Watch Style on Amazon or Best Buy. The smartwatch is available in three color options: Titanium, Rose Gold and Silver. Also, both U.S. retailers offer free shipping all across the country, so you'll only have to pay $179.99 – the price of the smartwatch. Keep in mind that the LG Watch Style does not feature 4G LTE support, unlike its more expensive brother, the LG Watch Sport. So, in case you need 4G LTE, the latter can be had for $249.99 with a 2-year contract or $349.99 outright. I want this deal in Canada. Over priced fugly watch...... Glad I got the gear s3 frontier.